All Things SW/MSP: Software Inventory - the report of your dreams!!! 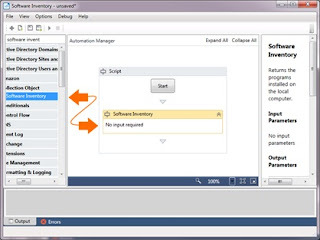 Software Inventory - the report of your dreams!!! 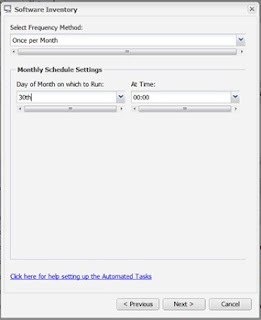 How often do your clients ask for a list of the software applications which is running on their workstations? The goal of this article is to show you a process to collect this information through an Automated Task and deliver it in a report for client consumption. There are a few things that you need to put into place prior to getting a report for the client. 3. Run a report for the Software Inventory task for use in an Excel like program. This is easy but there are a few steps to get the report and they will be documented here with images. Start a New Script and name it “Software Inventory” or something which makes sense to you. 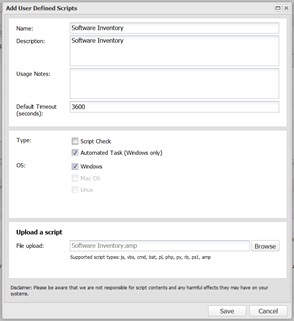 Select the devices which you would like to add the Software Inventory task and click Add Task. 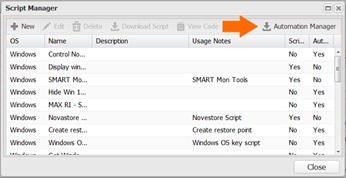 Press CSV Export to Open with Excel or Save File. After some scrubbing of the CSV file you will have a report which can be given to a client after you have manipulated the data for ease of client use. I then replaced ; ; with a unique single character and also replaced the space in front of Name: and then used Text to Columns to separate the installed software into individual columns for reporting.